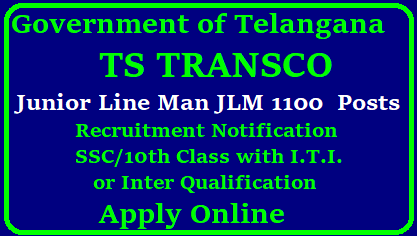 TSTRANSCO JLM Recruitment 2018 Notification - 1100 Junior Lineman (JLM) Posts: Transmission Corporation of Telangana Limited (TSTRANSCO) issued TSTRANSCO Junior Lineman Recruitment 2018 Notification for the recruitment of 1100 Junior Lineman (JLM) posts for Transmission Corporation of Telangana Limited (TSTRANSCO). Eligible candidates can apply online through tstransco.cgg.gov.in from 05.01.2018 to 20.01.2018. Note - The candidates who qualify in the Pole/ Tower Climbing test will only be eligible for appointment to the post of JLM. Minimum 18 years and maximum 35 years. Relaxation in upper age limit is permissible up to 5 years for SC/ST/BC candidates and up to 10 years for Physically Handicapped candidates. For in-service outsourced personnel engaged on contract basis, working in TS Power Utilities, the age at the time of entry into Power Utilities as outsourced worker will be considered. Eligible candidates can apply online through tstransco.cgg.gov.in from 05.01.2018 to 20.01.2018. Each applicant must pay Rs.100/- towards Online Application Processing Fee. This apart, the applicants have to pay Rs.120/- towards Examination Fee. However, the Applicants belonging to SC/ST/BC Communities and PH are exempted from payment of examination fee. Selection will be made through Written Test and Weightage Marks (20 marks maximum) for in-service. The written test comprising of 80 marks consisting of 80 multiple choice questions and each question carrying 1 mark. The section A consisting of 65 questions on core I.T.I subject and the section B consisting of 15 questions on General Awareness and Numerical Ability. The duration of the written examination will be of 2 hours. Weightage Marks (20 marks maximum) for in-service outsourced workers engaged on contract basis and who qualify in the Written Test. Click here to download Syllabus for JLM Written Test. Hm, interesting, who had passed all that probation? how many people did that? And how many didn't? And did the people who passed, use the discounts by Paperhelp.org? Because they are really big, and the service is really good, I would recommend it to any one who needs academic help..